Larmer Tree Festival is something I’ve really looked forward to sharing with you all. There are some posts that are just like that. I have enjoyed going back through our photos of our time at Larmer Tree Festival, and choosing the ones that sum up what a great time we all had. I missed out on the festival scene in my youth, and always regretted not going to events like Glastonbury and Creamfields. It was largely down to funds, if I remember correctly, but I always enjoyed the smaller local festivals I was able to get to. These days, the crowds at larger festivals really don’t appeal to me. And neither do the toilets, if I’m honest. When I found out about Larmer Tree Festival though, it sounded like something we could really enjoy as a family. We packed the car, to the brim I might add, and headed to Larmer Tree Gardens, near Salisbury, on the Wiltshire/Dorset Borders to see what this family boutique festival had to offer. 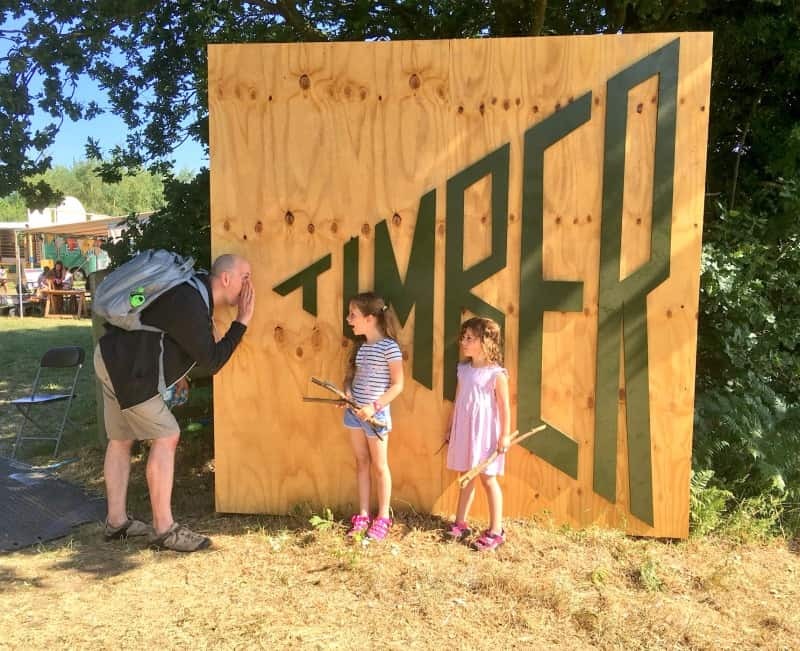 You can enjoy Larmer Tree Festival for a whole week, but as it was our first time camping with the girls we thought 3 days would be the best option for us. I soon realised I’d packed the car really badly when we weren’t able to park near our tent. We could have made life easy for ourselves and hired a trolley for half an hour, but being the stubborn folk that we are we made inventive use of Little Pudding’s pushchair to get all our gear to our pitch. After a little blood, sweat and tears we got our tent pitched in the quite camping area (in retrospect we might have been better placed in the family area) and headed of to explore what Larmer Tree Festival had to offer. First stop was food, and there are plenty of options around Larmer Tree Festival. You can get curry, fish and chips, even lobster if that’s what takes your fancy. There is a fashion for converting buses into festival cafes, and that was our first stop, or bus stop if you like! We got a great view over the festival and some amazing homemade chilli. This was before we discovered The Knitted Pig Cafe on Larmer Gardens, which soon became our favourite pit stop. This cafe sells reasonably priced family meals, snacks and cakes all day long. It has high chairs, toys and comfortable seating and was right in the heart of the children’s area. It was a big hit with all of us, and best of all didn’t break the bank. I’d really recommend hunting this out as soon as you get on site! 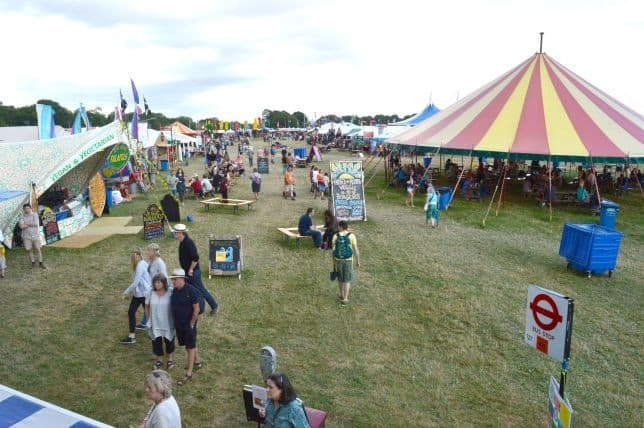 Larmer Tree Festival is set in the most gorgeous country side, and camping isn’t cramped or over whelming in the quiet and family zones. You of course, do hear the festival from your tent whereever you camp, but if you want your neighbours to respect a more reasonable bed time these areas are more likely for you. I was worried about arriving on site, and the toilets being blocked and overflowing after a week’s use already. The girls would be alright as we bought a camping potty, but I don’t think Daddy or I would fit on it. Well what a pleasant surprise the camping facilities were. The toilets were cleaned a couple of times a day, and their were showers and running water points in regular spots. With designated rubbish points too, the site was really clean and well respected by all the festival goers. All in all it really was a great experience. We had great weather, which of course helped too! 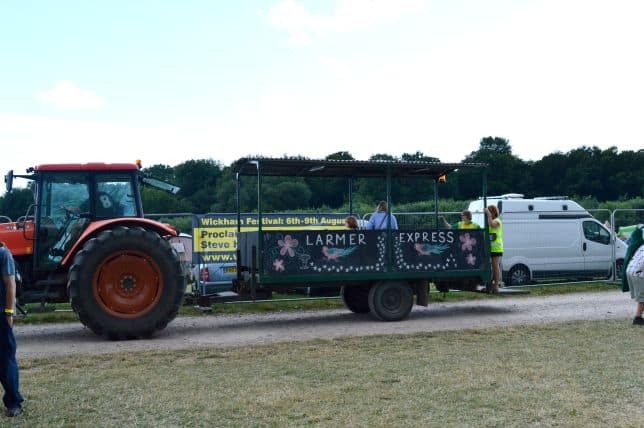 I can’t mention camping without introducing you to the Larmer Tree Express. This runs at designated times of day between the camp sites and the festival site. It provided our daughter’s little legs with a well earned rest, as well as giving her a fun ride on a tractor. Rides are free, but it’s worth making a small donation to the charity of their choice for the experience. 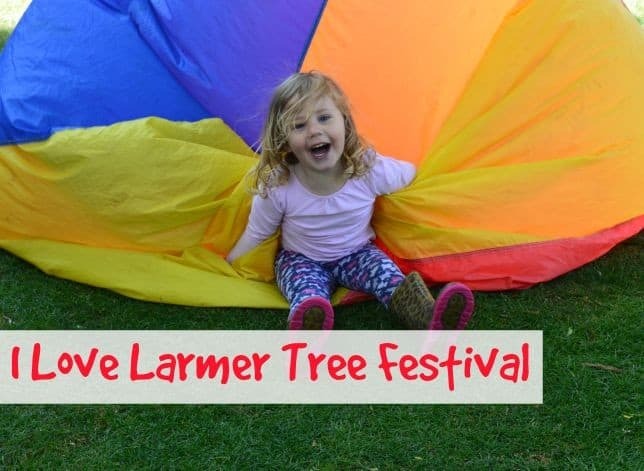 Larmer Tree Festival is the perfect place to take children and families. They have such a packed program of events and great facilities too. Their is a well stocked baby changing tent, with toy area to let babies crawl around and have a play. This really came in handy for us, so little pudding wasn’t stuck in her pushchair too much. 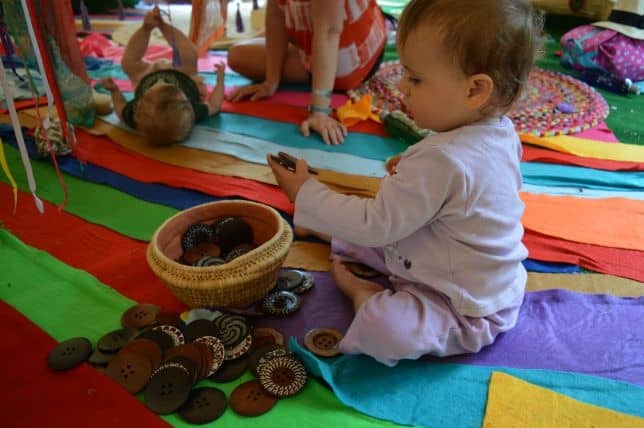 There’s also a lovely range of activity sessions from music to yoga aimed at under 5’s in the children’s tent from around 9am. We also got to meet the amazing staff from Odstock Day Nursery who filled the afternoon with sensory play sessions for little ones. Both the girls enjoyed exploring the lovely space they made, and we literally had to be kicked out at closing time. 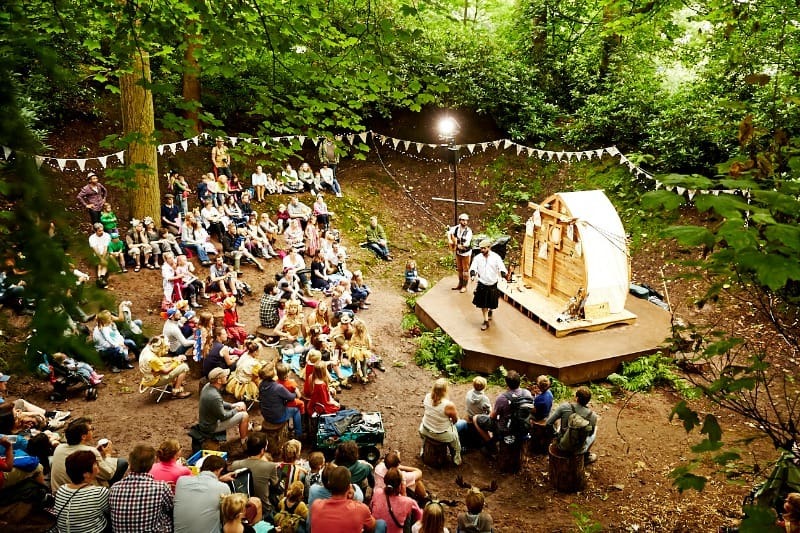 Fun and play are a big deal at Larmer Tree Festival, and we enjoyed outdoor theatre, puppet shows, story telling and lots lore. The girls had such a great time and were not bored for one moment. It was the perfect place to let kids be kids, away from TV and technology (which I have to confess there is probably a bit to much of in this house) and really enjoy quality time together. 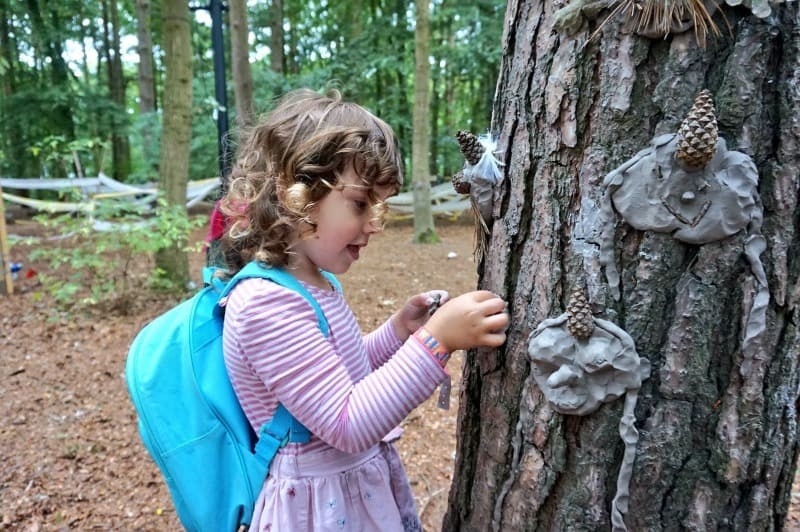 It’s a lovely safe environment, to let children get back to enjoying what the outdoors has to offer. 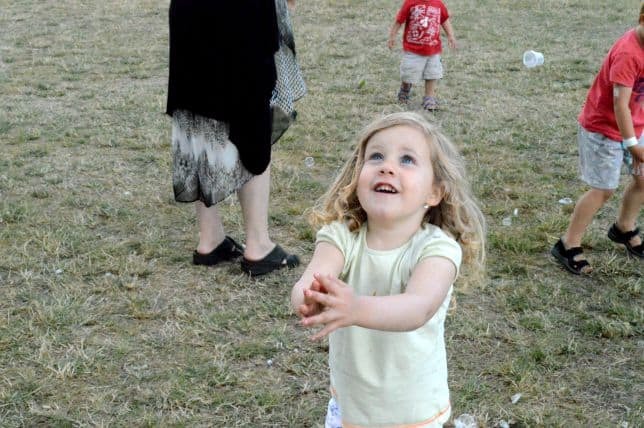 Where ever you looked there was an opportunity to chase bubbles, hide under parachutes and play drama games. There was a part of me that was a little bit sad that we didn’t go for longer. I think we would have enjoyed being there and we might of even got chance to see Sir Tom Jones headlining. I heard some of the older ladies in the audience went a bit wild, and there were a few incidents of fainting. How do I know all this? Well there was a small incident where Princess got stung by some insect. We hadn’t seen what it was, but her finger swelled up pretty quickly so we headed off to the First Aid tent to see if they could help us out. The lovely chap had just the thing, and soon had Princess right as rain. What ever it was he put on the sting, it didn’t bother her again so she could enjoy the rest of the festival. They also filled us in on some of the other goings on from Larmer Tree. 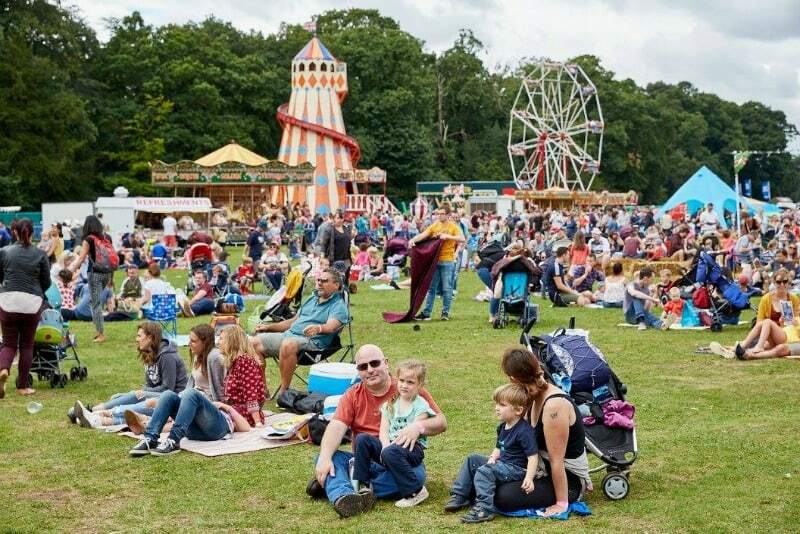 You can hire little wagons to pull kids around Larmer Tree Festival, which are great for seeing what’s on in the evening. Our girls were just a little bit young for these, and really value their bed time routine at the moment. Next year I think will be a different story though. There is of course a great line up of bands and entertainment through out the whole week, but I think I stumbled across one of the Larmer Tree highlights. To celebrate it’s 25th year, there was a very special fire poi display that I shared on instagram as it was happening. I was kicking myself for leaving my DSLR at the tent. What a silly blogger I was! 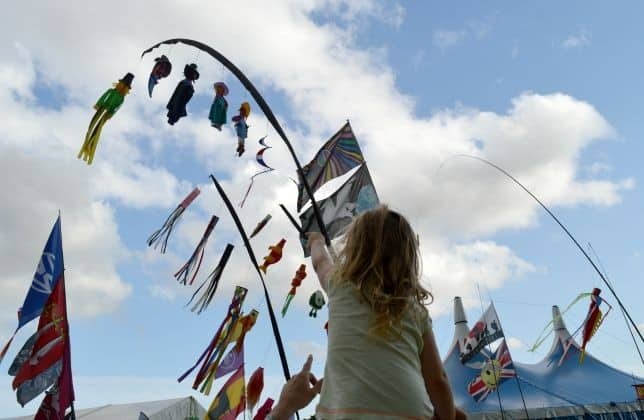 We were very luck to be invited to Larmer Tree Festival this year, and I have to say it surpassed our expectations in terms of what it had to offer families and children. It left us feeling like we wanted to see and enjoy more of it, so I really hope we get to experience it again next year. 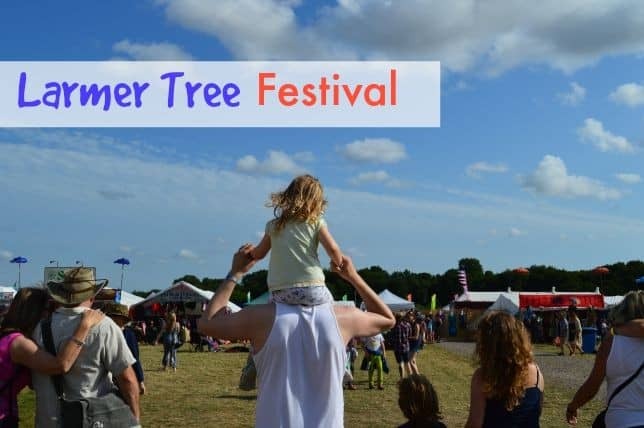 If you are thinking of introducing your family to festivals, I’d throughly recommend Larmer Tree as a great starting point. 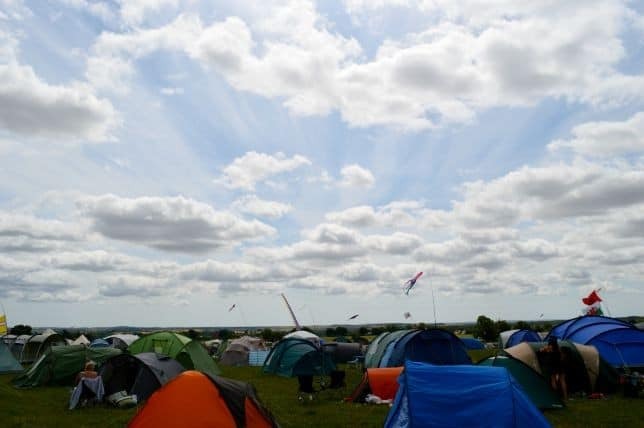 It has comfortable camping, weather permitting of course, great entertainment and lots for children of all ages to do. 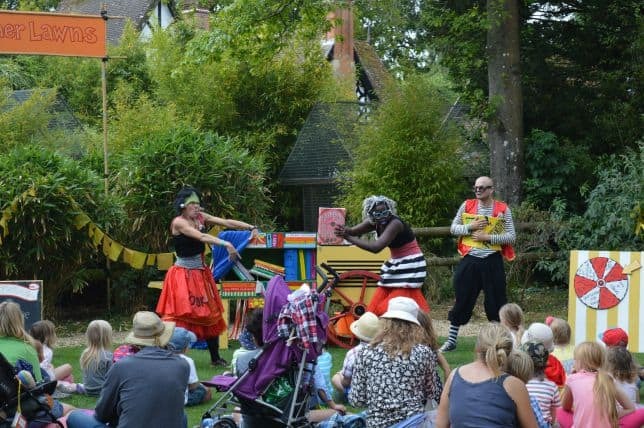 We have to say a huge thank you to Larmer Tree Festival for having us, it was a lovely experience for us to share as a family and something we hope to share with our children for many years to come. We were provided with a 3 day family pass in exchange for this post, but all thoughts, opinions and photographs are my own. 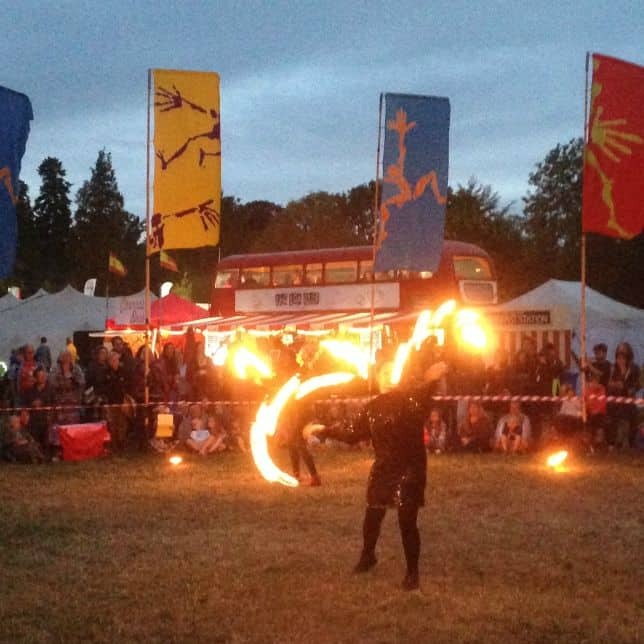 It looks like you had a fantastic time….I love festivals like this are so child friendly. Kim Carberry recently posted…Shopping for summer with Chemist Direct – Review!! This looks so amazing! Bet you had the best time ever. I would love to do something like this, but the OH hates pitching a tent!! Oh wow, this look amazing! What a fantastic trip you had =) I love all the photos! This sounds like a fantastic trip – and so child friendly! It’s great that you got to experience a festival as a family, and it turned out to be such a great experience too. Sometimes festivals can be a bit too much for the little ones but this looks like it was a perfect experience for you all. Princess and Little Pudding look like they’re having so much fun at all the different activities too. Thanks for linking up with me on Country Kids.